This is a dual-purpose marine battery of voltage power 12V and it belongs to group 31. With dimensions 13 inches by 6.8 inches by 9.4 inches and weight of around 84 pounds, this battery has been designed for heavy duty and commercial purposes. This battery has HCA of 2150 A and CCA of 1150 A and offers powerful starting power and fantastic deep cycle. The Odyssey 31-PC2150S dual purpose marine battery has pure lead plates that are packed with AGM design, which makes this battery one of the best and versatile marine batteries. 12 volts of voltage power and it belongs to group 31. This is applicable for dual-purpose operations. The Cold cranking amps is 1150 A and hot cranking amps are 2150 A, which make it good at any weather conditions and extreme hot bearable. Capacity of 100 AH and reserve capacity of 205 minutes, offering longer battery duration without recharging requirement for long period. This battery has 70% longer life cycles than other conventional deep cycle batteries and it can recover maximum of up to 400 cycles at 80% discharge depth. It is capable of very fast recharge and it has most probably the highest recharge efficiency among all the sealed batteries available at the market. It can be recharged 100% in 4 to 6 hours of continuous charging. This battery has versatile mounting flexibility with non-spilling design. Vibration-resistance design protects the battery from heavy mechanical vibrations and from the high impact of shocks. This feature also makes the battery tolerant to extremely hot temperature of up to 45° C and cold temperature of up to -40° C.
The plates are made from pure virgin lead that offers heavy-duty cycle and longer service life as well as cycle life. Long service life of at least 3 years to 10 years. 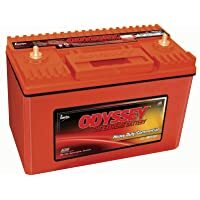 This marine battery from Odyssey is a dual purpose battery and it can be used as a cranking battery for starting the engine of boats, vehicles, cars, sports cars, recreational vehicles, golf carts and many more; it can also be used as a deep cycle battery to run various onboard vehicle or marine unit multiple accessories like trolling motors, GPS system, fish finder, lighting and many more heavy load demanding electronic appliances. This battery is an ideal choice for those individuals who need a group 31 heavy-duty dual purposes AGM 12 volts battery. Due to its massive starting power, heavy-duty commercial capacity, great durability and rapid recovery, it is the best AGM dual-purpose marine battery when compared to other conventional batteries of the same group available at the market. The Odyssey 31-PC2150S dual purpose battery has the ability to fulfill the high starting power demands of the specialized engines as well as the heavy load power demands for running various onboard appliances and last for long duration until the task is complete. It can handle even the difficult tasks that has rapid vibrations or in harshest climatic condition. This battery has plates that are made from pure virgin lead with maximum surface area that offer optimized recycling capacity. The sealed design and recombinant technology allows the gases to mix and form water within the battery, eliminating the need of refilling. With this battery the user doesn’t have to worry about even external corrosion on the battery as the terminals are made from tin-plated brass that are resistant to corrosion. The tough container and robust cell connections protect the internal cell from being affected due to vibrations. The plates are designed in six packs by avoiding dead space, due to which this battery from Odyssey has 40% more reserve capacity than other conventional batteries of the same size. This battery is also flame proof. As this battery is an AGM battery, charging can be an issue, as extra care should be maintained while charging this battery. The cost of this battery is quite high and it might not be able to meet the budget estimation of some buyers. The Odyssey 31-PC2150S is a true heavy-duty commercial use dual-purpose battery. With this battery one need not worry about any maintenance, not even about the external corrosion. It is a perfect battery for the professionals who need an industrial duty marine battery. I have 2 optima g27 batteries for my engines(Yamaha 250) and 2 of the same as house batteries. if I want to replace one house battery with the Odyssey 31-PC2150S and leave it joined with the other optima house battery which are all paired together for charging purposes, will I encounter any problems? ie: g27 grouped with a g31. if that isn’t a problem, what about just using just 1 Odyssey 31-PC2150S as the house. There is also an electric Bow thruster connected to the house and it requires MCA 1150. hope I’m clear enough for you.